Internet By default, this icon launches the Internet Explorer web browser. E-mail By default, this icon launches the Outlook Express email client. If your computer’s manufacturer or reseller preinstalled Windows XP, you might notice that the manufacturer or reseller altered the default Internet and email programs to support other software packaged with your computer. However, you should be able to further modify the defaults to reflect your own preferences. Display the Customize Start Menu dialog box, as described in the previous section. If you want the Internet icon to appear on the Start menu, leave the Internet check box activated; otherwise, deactivate it and continue with step 4. If the Internet check box is activated, use the list to its right to choose the web browser you want associated with the icon. If you want the E-mail icon to appear on the Start menu, leave the E-mail check box activated; otherwise, deactivate it and continue with step 6. If the E-mail check box is activated, use the list to its right to choose the email client you want associated with the icon. Here, client is the name of the executable file of the program associated with the icon (such as Iexplorer.exe for Internet Explorer). The (Default) setting controls the icon text, and the (Default) setting of the DefaultIcon subkey controls the icon. Here, client is the name of the program associated with the icon (such as Outlook Express). The (Default) setting controls the icon text, and the (Default) setting of the DefaultIcon subkey controls the icon. Note that you might have to create this subkey. You can modify Windows XP (with Service Pack 1 or later installed) to use other programs as the default for activities such as web browsing, email, instant messaging, and media playing. This enables you to have your favorite programs available in more convenient locations and to have those programs launch automatically in certain situations. Your version of Windows XP is most likely set up to use Internet Explorer, Outlook Express, Windows Messenger, and Windows Media Player as the default programs for web browsing, email, instant messaging, and media playing, respectively. This means that Internet Explorer and Outlook Express are associated with the Start menu’s Internet and E-mail items. Also, it means these programs launch automatically in response to certain events. For example, an audio CD you insert plays in Windows Media Player. Select Start, Set Program Access and Defaults. Windows XP displays the Add or Remove Programs window with the Set Program Access and Defaults item selected. Computer Manufacturer This configuration appears if your computer vendor defined its own program defaults. Microsoft Windows This configuration is the Windows default as defined by Microsoft. Non-Microsoft This configuration is generated by Windows XP if you have one or more non-Microsoft programs available in any of the categories (such as a web browser or email program). Custom Use the item to configure your own default programs. 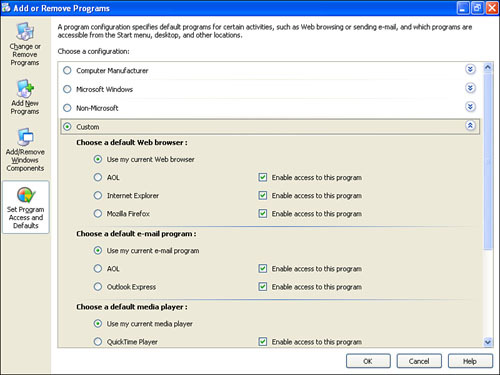 Activate the option buttons of the programs you prefer to use as the system defaults. Deactivate the Enable Access to This Program check box for any program that you don’t want other users to have access to. Figure 3. In Service Pack 1 or later, use the Set Program Access and Defaults feature to set up a custom program configuration for your system. Click OK to put the new defaults into effect. The Start menu’s list of favorite programs is such a time-saving feature that it can be frustrating if a program drops off the list. Another aggravation is that the icons often change position because Windows XP displays the programs in order of popularity. When you display the Start menu, this constant shifting of icons can result in a slight hesitation while you look for the icon you want. (This is particularly true if you’ve expanded the maximum number of icons.) Contrast both of these problems with the blissfully static nature of the pinned programs list’s Internet and E-mail icons, which are always where you need them, when you need them. Right-click the shortcut and then click Pin to Start Menu. Drag the shortcut and drop it in the pinned programs list. You can also use this technique to pin shortcuts residing on the desktop to the pinned programs lists. If you decide later on that you no longer want a shortcut pinned to the Start menu, right-click the shortcut and then click Unpin from Start Menu. The right side of the Start menu contains a number of built-in Windows XP features, which are set up as links. That is, you click an item and a window or a program runs in response. That’s fine for items such as Search or Run, but it’s not very efficient for an item such as Control Panel where you’re usually looking to launch a specific icon. It seems wasteful to have to open the Control Panel window, launch the icon, and then close Control Panel. Display the Customize Start Menu dialog box as described earlier (see Figure 2). In the Start Menu Items group, activate the Favorites check box to add a menu of your Internet Explorer favorites to the Start menu. In the Start Menu Items group, find the Network Connections item and activate the Display as Connect to Menu option. This gives you a menu of network connections, and you can launch any connection by selecting it from the menu. In the Start Menu Items group, find the System Administrative Tools item and activate the Display on the All Programs Menu and the Start Menu option. This gives you an Administrative Tools menu that offers shortcuts to features such as Computer Management snap-in, the Performance monitor, and the Local Security Policy editor. Make sure that the List My Most Recently Opened Documents check box is activated. This adds the My Recent Documents menu to the Start menu, which displays the last 15 documents that you worked with. Click OK to return to the Taskbar and Start Menu Properties dialog box.